TerraVelo Tours organizes an all-inclusive luxury camping escape with bicycling, horseback riding, massages and other amenities. 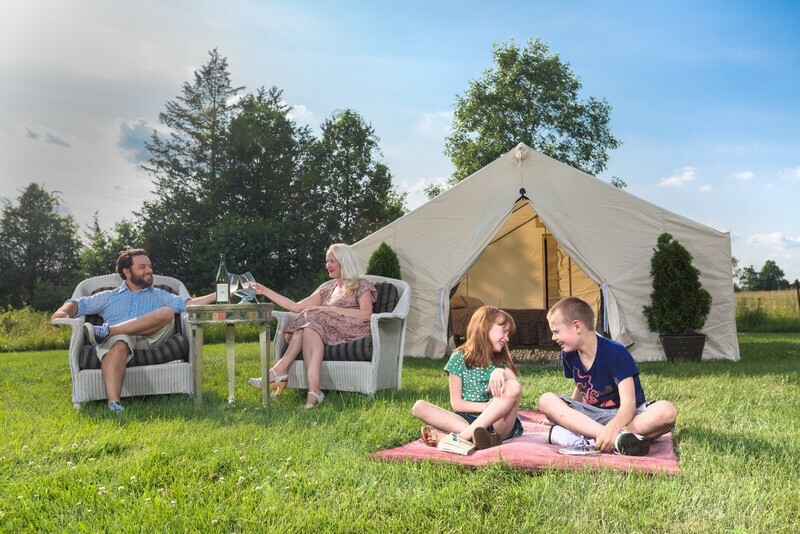 This year, give your family the gift of your time and a shared experience to remember – a luxury camping (aka “glamping”) and cycling tour of the spectacular landscapes of Utah or Wyoming National Parks, or California’s vineyards and redwoods with TerraVelo Tours. TerraVelo Tours offers fully-inclusive luxury mobile tent camping travel for both avid and casual cyclists – providing an unforgettable journey for both skill sets – TerraVelo has even created an elegant way to present your gift: a TerraVelo tote bag, complete with a custom-designed voucher and your choice of a selection of bath amenities from historic C.O. Bigelow & Apotheke Co. or a TomTom MultiSport GPS watch. Utah Arches, Canyons and Hoodoos through Arches, Zion, Canyonlands, Capitol Reef and Bryce National Parks brings guests through some of the most jaw-dropping scenery in the nation. Departures are April 12-19; May 3-9 and 10-16; September 20-26; and October 4-10. Wyoming Mountains, Geysers and Bison tours include stops at Grand Teton National Park , Jackson, Yellowstone National Park including Old Faithful, Norris Geyser Basin, the Hot Springs Loop, the unique landscape of Mammoth Hot Springs and the Lamar River Valley. Tours depart June 28-July 4; July 19-25 (Family Tour); and July 26-August 1. The California Oceans, Vineyards and Redwoods tours encompass stops at Point Reyes National Seashore, Santa Rosa, Sonoma, Napa, Armstrong National Redwoods Preserve, Salt Point State Park, and sunrise yoga followed by a cycle through the Avenue of the (Redwood) Giants. Departures are May 24-30 (Family Tour); June 14-20; August 9-15; August 16-22; and August 30-September 5. Guests will be outfitted with a carbon fiber specialized Roubaix Expert Ultegra or similar high-end road bike and helmet; those preferring to ride their own bike can simply bring it to their local bike shop where TerraVelo will have it shipped, delivered and assembled, ready to ride when the guest arrives, and shipped back to the bike shop upon departure. Each of the luxury tents simulates an upscale hotel guestroom, outfitted with plush memory-foam mattress; Frette linens; down comforters; rugs; furnishings from ABC Home & Carpet and Mitchell Gold +Bob Williams; Turkish bath towels; and C.O. Bigelow & Apotheke Co. toiletries and sundries. Each night’s Camp will include: a full-time personal chef and sous chef who will prepare all meals served in the elegant dining tent. Several times during the tour guests can enjoy sunrise yoga; evening entertainment including live music and campfire; a masseuse who will provide 30-minute massages; educational sessions from a visiting expert, perhaps an astronomer and/or geologist who will share insights on the gorgeous night sky, landscape and vegetation. Laundry service is provided twice during each tour. For 2015, TerraVelo Tours will host dedicated Family Tour weeks in Wyoming and in California, welcoming children as young as 8. The 7-day tour packages include all food, beverage and accommodations, and are priced at $5,990 per person, double occupancy, with guests’ choice of one Queen bed or two singles. Children’s rates are $4,990 with single bed accommodations in parents’ tents; youngsters 16 and over pay the adult rate. For information or reservations, call 888-801-1446 or visit www.TerraVeloTours.com. This entry was posted on December 7, 2014 at 11:34 pm and is filed under adventure travel, air-inclusive vacation packages, camping, cycling, family travel. You can follow any responses to this entry through the RSS 2.0 feed. You can leave a response, or trackback from your own site.